I introduce you two performances. One performance is in Yokohama (Japan), it's a sound, dance and visual mixed performance that I had joined two times at Bankart 1929 in 2004. I can't perform this time, though I guess you'll able to watch a great and interesting performance. 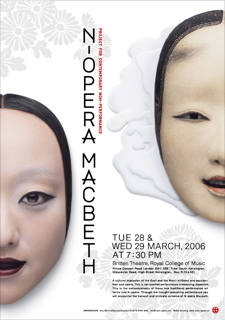 The other a performance in London, This is 'MACBETH' and it's a new style performance that is collaborated Japanese traditional performance 'Noh' and 'Opera'! I support this performance just as a cameraman, and I'm really looking forward to watching this performance. Peroformers are not only Japanese but English. Usually Noh is perofrmed with only male performer, but this time female perfromer do it! It's very interesting and sensational! Let's enjoy it together! If you interested in these performances, click detail. ※I have £5 tickets, please give me a message if you want. 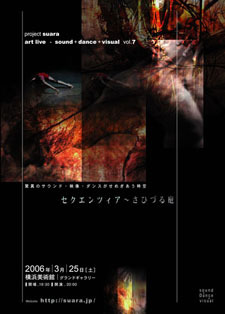 ■Concept：N-OPERA is a unique and innobative style of theatre performance. It is generated from blending the similarities and divergences of the Japanese performace art 'Noh' and the western Opera. 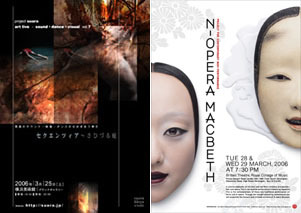 This N-OPERA MACBETH takes the audience on a journey into a magical and fantastical world led by exquisite contemporary music written by Akiko Adai. This opera is presented in Japanese and performed by musicians from the Royal College of Music and Japanese Noh performers from the kanze school. The conpany believes that the core concept of this performace is to explore the darkness which exists within Macbeth's mind and how this links to the Noh aesthetic of Yugen. ■Producer/Artistic Director : Kan Yuki.